One tool in your hand is worth two in the bush. Bellota toolboxes have greater capacity for more easily storing and locating your whole toolkit. 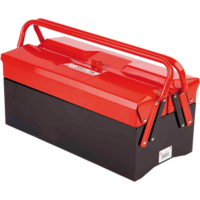 Don't waste your time searching, all your projects fit in our toolboxes. Made with higher resistance materials, so that they last a lifetime. Multi-level to store all your tools. Even a 12-inch hacksaw frame will get in there. Easy and uniform opening, with drawers you can open with a single hand, for faster working.